The root bark of the Periploca sepium Bge of family Asclepiadaceae. Shanxi, Henan and Hebei provinces, etc. Collected in spring and autumn. Dried in sunlight, sliced and unprocessed. Pungent, bitter, warm; toxic; liver, kidney and heart meridians entered. Dispel wind-damp, induce diuresis to alleviate edema. Being pungent and bitter with the action of dispersing and drying, fragrant and warm with unblocking, it can dispel wind-damp and warm meridians to alleviate pain. For arthralgia syndrome due to wind, dampness and cold, pain and spasm of joints, it is often combined with other wind-dispelling, damp-removing and cold-dispelling herbs. For chronic arthralgia syndrome characterized by paralysis of tendons and bones, it should be combined with liver-kidney tonics, tendons-bones-strengthening herbs, and tendons-soothing and collaterals-activating herbs, such as Ba Ji Tian, Huai Niu Xi and Mu Gua. 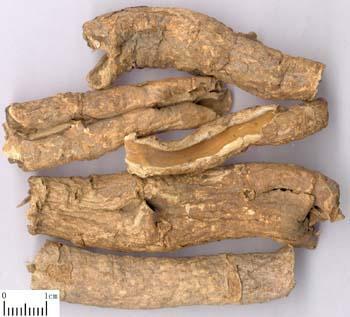 Being bitter and warm with the action of descending and unblocking, it has the action of inducing diuresis to alleviate edema. For edema and difficulty in micturition, it is often combined with diuresis-inducing, and qi-moving herbs. For instance, Fu Ling Pi, Da Fu Pi and Chen Pi, etc. Decoct 3~6 g; or soaked in wine, made in pill or powder for use. Overdosage should be avoided because it is poisonous.